The Senior Partner of the Estate, Trust, Elder Law and Probate Administration Department at Cramer & Anderson LLP, Attorney Arthur C. Weinshank represents individuals, families, and businesses, providing a full range of tax, estate, and elder planning services. He addresses both the personal and tax concerns of clients when counseling them on how to pass their assets on to the next generation. Attorney Weinshank advises clients in estate administration on matters dealing with estate settlement, trust administration, and business succession planning with a focus on avoidance and deferral of income, gift, death, and other transfer taxes. He has decades of experience in drafting basic and sophisticated wills, trusts and related estate planning documents and is also well versed in the field of Medicaid and long-term care matters. In his leadership role for the firm, Attorney Weinshank developed the largest Estate Planning and Probate Administration Law practice in Litchfield County. Building upon that foundation, he guided a strategic expansion into Fairfield County in 2017 which included the opening of a new Ridgefield office. As he has helped to chart the firm’s growth, Attorney Weinshank has also devoted equal leadership to helping clients become agents of change. Instrumental in envisioning, creating, guiding, and managing influential charitable funds and foundations, Attorney Weinshank annually oversees millions of dollars in the foundations he manages and directs hundreds of thousands of dollars in contributions each year. As the force behind the creation of The Lawrence J. Portell and Natalie D. Portell Foundation, Inc., Attorney Weinshank is writing a new musical score of possibility at the University of Connecticut. The Foundation is funding an effort to enhance excellence in UConn’s Music Department with new Steinway pianos. The late Academy Award-nominated actor Richard Widmark entrusted management of his philanthropic legacy to Attorney Weinshank, who is Director of The Jean Widmark & Richard Widmark Foundation, Inc. In recent years, Attorney Weinshank has guided Foundation donations to a wide range of change-the-world nonprofits, including the Southern Poverty Law Center, The Brady Center to Prevent Handgun Violence, Healing the Children Northeast, and Regional Hospice and Home Care of Western Connecticut, for which the Foundation is a major sponsor. Attorney Weinshank facilitated the creation of the Persbacker Family Foundation, for which he now is a Director. The Foundation contributes to such life-altering entities and programs as an elementary school music therapy program for autistic and Down Syndrome children. Closer to home in Connecticut, the Foundation gave a $20,000 grant toward the restoration of the Derby Historical Society’s General David Humphreys House & Museum. 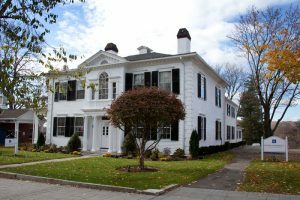 Attorney Weinshank became a member of the New Milford office of Cramer & Anderson LLP after practicing with a New York tax firm and he obtained his LL.M. in Taxation from New York University School of Law. President, Hunt Hill Farm Trust, Inc.
Director, The Jean Widmark & Richard Widmark Foundation, Inc.
Chairman, The Lawrence J. Portell and Natalie D. Portell Foundation, Inc.
Director, The Stevek Foundation, Inc.
Jeremy Ruman has been Attorney Arthur C. Weinshank’s legal assistant for over 18 years. She handles all administrative aspects of Art’s tax, estate and elder law planning practice and devotes a substantial amount of time to interacting with his clients. Jeremy can be reached at jruman@crameranderson.com860-355-2631, ext. 132. Donna M. Dube, Judith L. DeWolfe, and Lisa DeAngelis are paralegals for Attorney Weinshank.